Scientists at North Dakota State University (NDSU) have developed a unique process for high-volume production of silicon nanowires based on electrospinning. The technology can be used for the development of lithium ion batteries with significantly improved energy densities and long life, consistent with performance targets established by the US Department of Energy for plug-in hybrid electric vehicles. GREEN TECHNOLOGY! Enables the creation of lithium ion batteries with significantly improved energy densities and capacities. 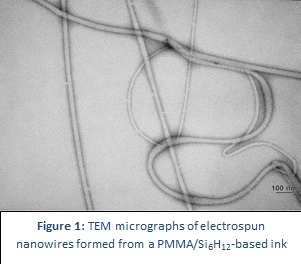 Provides a high-volume route to the production of silicon nanowires. Allows the production of silicon nanowires as a high-volume, continuous, roll-to-roll manufacturing process, which other methods of silicon nanowire fabrication have failed to achieve. North Dakota State University (NDSU) has developed unique synthetic routes to a novel liquid silicon precursor, cyclohexasilane (Si6H12), which is converted to silicon nanowires by electrospinning. 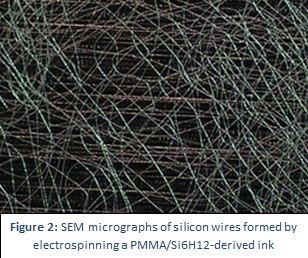 ;Readily purified by distillation, the liquid nature of Si6H12 allows the development of a high-volume electrospinning route for silicon nanowire production. Because the spun wires convert to amorphous silicon at relatively low temperatures, formation of excessive surface oxide and carbide phases can be avoided which would otherwise negatively affect capacity and rate capabilities. The technology can be used in the development of anodes for use in next-generation lithium ion batteries, in which the traditional carbon-based anode is replaced with a silicon-based anode for a dramatic increase in capacity (theoretically over 1100% increase in capacity). Silicon nanowires can expand radially during cycling without fracturing, enabling the use of silicon as an anode material for lithium ion batteries. This technology is the subject of Issued US patent 9346966 and issued Japanese patent no. 5889276.